It’s here! Digging Into WordPress Version 3.0 is packed with goodness, including a new chapter on WordPress v3.0, updated core content, added resources, and a super-sleek new cover. Plus other great stuff like how to use the built-in shortlink feature, author templates, comment-form template-tags, and more. It’s 20+ pages of new WP3.0 content. Like WordPress itself, Digging Into WordPress gets better with each new version. And the nice thing about PDF format is that you can read the book anywhere, even on eReaders like the iPad. Plus you get useful stuff like actual, clickable hyperlinks and linked Table of Contents. Also, the PDF format makes it easy to copy/paste code and other content, so you have everything all in one place. You can learn more and get the book here. We were sort of on the fence about printing more copies of the book, but after some great feedback, everything fell into place. Our current goal is to make printed copies of v3.0 available sometime in September/October. The printed books tend to go fast, so if you want a copy stay tuned for the announcement post and more information. Update: Printed books are here! Here is an updated Sample Chapter showing the new Table of Contents and part of Chapter 3. 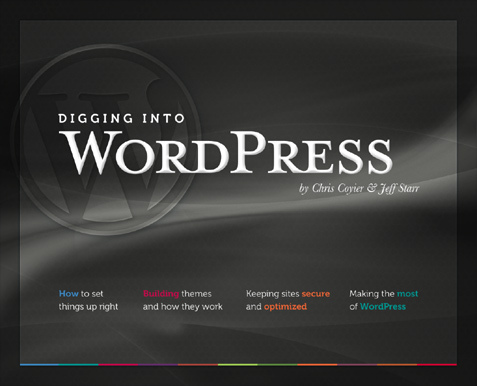 For more information on Digging into WordPress, check out the Official DiW Bookstore at DigWP.com, the free companion site for the book, featuring tons of awesome WordPress tips, tricks, and tutorials. As always, comments, suggestions, and concerns are welcome. Awesome, I missed my lifetime upgrade, just checked my email and bingo – there it is, thanks guys! please,i need a thorough guide on how to design my wordpress.and how i can pull traffick to my site.can you help,pls? If we buy the ebook, do we get any kind of discount on buying the hard copy when it comes out later on? Thanks Jeff, you’re really a great source of knowledge and inspiration. I’d love to support you by buying the book! Sorry but we can’t discount the price of the printed book. We’re including the PDF with the printed book as a bonus, because printing costs are so high. If you’re planning on getting both PDF and print copies, waiting a bit longer will get you a better deal. We are still waiting for the final numbers from the printer, but it looks like it will be around same price, possibly a few dollars more. Not sure yet at this point if we’re doing any international shipping – will post at DigWP.com as soon as we get the specifics. Ok, fingers crossed for international shipping. This is almost the only WordPress book that I really would love to have in my IRL bookshelf! @Aaron: It looks like we sent a new link on 9/21 and then another on 9/22.. Let me know if you got the book OK or if you still need help with this.